For many people anxiety is a daily occurrence. Many don’t even know they are anxious. They feel stressed. Maybe they have a vague sense that something isn’t right. They can’t quite put their finger on what the problem is. Some people feel something in their body. They get a headache. Or their chest feels tight. But other people get angry or explode for no reason. Does this describe you? If so, you may be one of the 40 million Americans that experience anxiety at some point in their lives. What can you do about it? Mindfulness meditation can help relieve anxiety. How does meditation work? What sort of meditations are helpful for anxiety? Let’s explore some of these questions. The solution that most Americans reach for is a pill. Many people turn to medication. And for many, drugs can help relieve symptoms. But they don’t remove the underlying cause. As I’ve written elsewhere, testing can reveal the underlying physiological causes. But what if there is nothing measurably wrong with your body. Now what? Meditation may be able to help. For many people, anxiety is a common occurrence. They know they are anxious. They know what it feels like and it’s not comfortable. They can’t sit still. Their focus is terrible. They are antsy. They might even feel a little agitated. Focusing on anything is difficult. Other people don’t know they are anxious. They are agitated. They may get into a fight with friends or loved ones. Or they mindlessly eat. Meditation can help break these patterns. It used to be that when meditation was brought up, one’s thoughts went to crosslegged monks on a mountain top. But meditation has become common in the US. The National Institute of Health estimates that about 18 million adults practice meditation on a regular basis. So what exactly is meditation? It is the act of calming one’s mind and bringing attention to one thing. It could be counting breaths or watching a candle. Every time your attention drifts off you bring your attention back to that one thing. It is a state of calm alertness but more than concentration. Concentration may be focus on one object. Reading may be concentration, but it isn’t meditation. There is a calm stillness to meditation. You just watch. You watch your breathing, you watch your thoughts. There is no attachment to anything. Writing could be a form of meditation. As I write at this moment, it is like meditation. I am concentrating and watching my mind. But I have an agenda. I want to be sure to cover certain topics. My attachment precludes me from meditating. Meditation is about letting go of outcomes. You are just still. And if you can’t be still, you notice that. Meditation brings many health benefits. The most obvious is stress reduction. But some research has shown that meditation helps other health problems too. These include lowering blood pressure, improving IBS symptoms, and relieving depression and anxiety. It doesn’t help everyone, and I’ll get to that in a moment. But it does appear to change brain circuits involved with regulating emotions. This will help reduce inflammatory and stress hormones. In theory, meditation sounds great. But how do you meditate if you’re anxious? We’ve already figured out that you can’t sit still! Sometimes you can’t calm your thoughts down. And sometimes, the act of meditating can make you feel worse. When I was studying counseling psychology, I had a supervisor, Gail Sher, who is a Buddhist. She was an avid meditator. She advised against prescribing meditation for people with anxiety because it often made things worse. They might become more anxious trying to meditate. So how can one benefit from meditation if one is anxious? There are several options. Let’s run through a quick list. Breath work: Meditation is about slowing down. When we are anxious, everything tends to speed up. Slow down your breath and see if that helps. Sometimes one minute of steady breathing – an inhale for 6 seconds followed by an exhale for 6 seconds – can help. Often, when one is anxious, it’s because the brain’s alarm response is on over-drive. Simple breath work can be enough to start sending signals from the heart to the brain to turn off the alarm response. Take a moment to feel your body: Don’t try to push the sensations away. Just feel the anxiety. Notice how jittery you feel. Or notice the tightness in your chest. Just feel what you are feeling in your body in the moment. Don’t judge it and don’t try to change it. If you have experienced a lot of trauma in your life, this may be difficult to do on your own. Many people who have experienced trauma have difficulty feeling their bodies. If that’s the case, try another method. And get help from a qualified trauma specialist. Listen to the sounds outside: If you can get into nature and listen to the sound of birds, waves, or running water, that can be healing. Many of my patients report feeling less anxious after walking in the woods. Be mindful of what you are doing: Focus on one task and do just that task with full attention. It can be almost anything, so long as it has your full attention. But it should be something that doesn’t stress you out. For example, don’t try to balance your checkbook if that makes you stressed, and be mindful of that. Do something you like to do, but do it with your full attention. If you know why you are anxious, you can talk over the issue with a friend. Maybe you have been ruminating or worrying about something. Getting an outside perspective can help ..
Focus on the Anxiety: For some people experiencing the anxiety can be extremely liberating. Often, it is the avoidance of the discomfort that makes it worse. Feel the anxiety. Feel what your body feels like anxious. Notice how you have difficulty breathing. Don’t try to change it. Just let it be there without judgment. Avoiding judgment is one of the most important things for anxiety. It’s OK to feel anxious. It’s OK to experience whatever it is underneath the anxiety. Anxiety isn’t truly an emotion. It’s a state of not feeling an emotion. It’s more rumination on something that isn’t happening in the moment. And that is why getting into the moment through meditation or other means can be so helpful. If you have trouble with these techniques or meditation it may be that something else is out of balance. It could be something in the brain or the body. Neurofeedback and HeartMath can be extremely useful. LENS neurofeedback can help train your mind to be less reactive to situations. HeartMath is biofeedback that helps people use breath and good feelings to bring body systems into alignment. Both are powerful in gaining some of the benefits of meditation without meditating. Of course, there could be a biochemical imbalance, but I don’t recommend medication. Simple blood and urine tests may uncover the imbalance and help you find balance with a simple supplement regimen. Anxiety is a big problem in America at the moment. I see many patients with this problem and/or other mental health issues. Fortunately, there is help available without drugs. Meditation may be a good solution for many. But if it makes your anxiety worse, stop. Try one of the techniques above. If those don’t work, get professional help. It may be that you will need it anyway. But mindfulness has helped many people all over. Don’t let anxiety stop you from being your best self. In other articles, I’ve talked extensively about neurofeedback therapy including LENS. LENS is short for Low Energy Neurofeedback System. But how does LENS work and what does it treat? LENS neurofeedback is excellent for mind-body healing. It helps both physical issues such as migraines, autism, and post-concussion symptoms. But it can also help issues in the mind such as emotional trauma and post-traumatic stress disorder. In this article, I’d like to discuss how LENS works to help these conditions. LENS neurofeedback is a simple procedure that helps heal the brain. Using the patient’s brain wave pattern, the system nudges the brain. This helps it transform maladaptive patterns. Parts of the brain that aren’t functioning optimally start working more efficiently. Over-functioning areas return to a more normal level. The procedure of neurofeedback therapy is simple. The patient has wires attached to the ears and scalp. The wires have a clip at the end and are technically called “leads”. With LENS, there are one on each ear and one or two attached to the scalp. I generally start with mapping. This is a mild form of treatment but the purpose is to determine the current state of the brain. The patient sits in the chair and closes her eyes for a moment. Depending upon the protocol, they may close their eyes for a few seconds or a few minutes. This is repeated depending upon the type of session (mapping or not) and what the treatment goals are. In general, sessions don’t have to last long. Generally, no longer than 30 minutes. I spend a lot of the session assessing my patient before and after giving neurofeedback. I want to see subtle changes that may have happened during the session, but also during the previous week. In general, I work with patients on a weekly basis. Generally, it takes 2-5 sessions to complete a map depending on the person. Some patients are more sensitive or reactive and benefit from fewer points over time. With LENS neurofeedback, sometimes less is more. Fewer points result in bigger changes. With a completed map, I start to analyze it. I won’t go into all the details of the maps here, but we can explore some of the concepts related to maps and neurofeedback therapy. Brain waves have two basic measurements, amplitude and frequency. Amplitude represents the height of the waves. Frequency is the speed of the wave. In general, there are four types of brain waves that are measured with neurofeedback. The chart below is a short summary of that information. The frequency determines the type of brainwave. Each wave frequency will also have a height. A person can have delta waves, for example, with tall or short amplitudes. The different types of waves and amplitudes give us a picture of what is happening in a patient’s brain. As you can see from the table, different types of brain waves have different meanings. There is a healthy and an unhealthy pattern to each type of brainwave. Treatment protocols change depending on what symptoms the person is having. How does LENS Neurofeedback work? We don’t know exactly, but we do know that it works. Several studies on the instrumentation have shown that very little energy goes to the brain. It produces 10-22 watts/cm2. That’s not much energy. When it was first tested, scientists assumed it must be a placebo effect because it is so low. But double-blind placebo-controlled studies have shown changes that could be seen on fMRI. A functional MRI can measure changes in the brain in real-time. Patients who received real LENS treatment showed changes while those who received the control didn’t. So what is going on? It may have to do with brain plasticity. Brain plasticity is a term coined by Marion Diamond, Ph.D. from UC Berkeley. She published a paper in 1970 suggesting that our brains adapt when we are exposed to different situations and stimuli. This allows for the brain to develop continuously if stimulated. As a side note, Dr. Diamond was a professor of mine when I went to Cal as an undergrad. She would write on the chalkboard with both hands and she could play tennis with both too. (Not in class though.) She told us she did this to work both sides of her brain. LENS neurofeedback can treat almost any condition related to the brain. I have treated people with Multiple Sclerosis, anxiety, depression, autism, insomnia, OCD, migraines or other headaches, RAD (Reactive Attachment Disorder), ADD, and Parkinson’s. The results have been great for all, although other Naturopathic treatments were necessary in some cases. Where I have seen the most incredible results with LENS is in treating concussion and PTSD. Patients respond amazingly well. We used to think that neurons died after injuries. We now see that they don’t die. They involute. Connections get lost and the brain doesn’t work as efficiently. LENS appears to wake those neurons up. The patient’s symptoms start to lift and their situation improves. It may be a clue as to how this form of neurofeedback therapy works. And it may be why LENS is so helpful with other conditions. In some cases of anxiety, insomnia or ADD, for example, a concussion is the precipitating event. With PTSD, patients appear to have a decrease in reactions to situations. With LENS treatment, they become more aware of their reactions to situations. This allows them to function better in relationships, their jobs, and in society. There are many types of neurofeedback therapy, but I use LENS predominantly. LENS neurofeedback is an excellent method to treat a variety of conditions. It is simple, easy, effective, and has few if any, side effects. While sometimes side effects do happen, such as fatigue, they are short lasting. The benefits, though, are not. I find that the majority of my patients improve from neurofeedback therapy regardless of their condition. You can email me or call my office to learn more or to schedule a session. I look forward to meeting you in person. Tammy, not her real name, came to me 10 months after a car accident. She was having trouble with school. She couldn’t focus for longer than 15 minutes at a time. That’s difficult when you are attending a top-ranked liberal arts university. Her medical doctors had told her rest would make everything better. There were medications that could help. She refused, not wanting to take pharmaceuticals. Her mother had found me online and made an appointment for her daughter to see me for concussion treatment. Six weeks later she was back to her regular self. School was going well, sleep had improved, anxiety disappeared, her headaches abated. Recover from a traumatic brain injury (TBI) is possible without pharmaceuticals. How do you treat concussion? How do you see so much change without drugs? To understand this, it is important to explore more about TBI. What is it? What symptoms arise from it? By answering these questions we begin to get a better idea of how to treat. Six years ago, I wrote an article about concussions and Traumatic Brain Injury (TBI). The statistics were sobering; they still are. TBI affects millions of people every year. 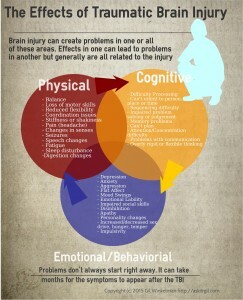 TBI can affects not just the brain. It can create physical, behavior, emotional, and mental problems. Many people don’t even realize that their health problems may have started with a TBI. There are many ways people get injured. The CDC estimates that there are around 3.5 million ER visits yearly due to TBI. Falls, sports-related injuries, motor vehicle accidents, and being struck in the head by an object are some of the leading causes of TBI. Some researchers believe the number may be much higher than that. There may be as much as 4 times that many TBIs than the CDC count. What these numbers don’t tell are that many people live with the consequences of a TBI long after the event. Between 3-5 million Americans live with an impairment related to a TBI. TBI can create long term problems. Cognitive issues, including focus, concentration and memory are associated with concussion. But most of the people who come to see me don’t even recognize that there was injury such as Jessica. Depression, anxiety, insomnia, headaches, migraines, and fatigue may all start with a TBI. Most people come to me because of one of those problems, not because of a concussion. There are other health risks associated with TBI. Not long ago, the idea of TBI or concussion was such that it had to be severe to have any long term consequences. We are learning that even a mild concussion can create long-term severe consequences. Head trauma, even from minor incidents, can cause a wide range of mental, emotional, and/or physical ailments. Dementia risk appears to be greater as well. Living with the effects of a TBI can be devastating. Shocking stories abound of how former professional football players and veterans take their own or others lives. Millions of others live with the long-term effects without any of the fanfare. They just have the struggle. I (and others) have helped people recover from TBI. And that recovery is safe, effective, inexpensive, and non-invasive. I am working on a more detailed article to describe treatment of these problems. For now let me give a brief overview. Treatment comes in two different modalities, supplementation and biofeedback. Supplementation can handle some of the symptoms and may reverse the damage. Vitamin D, magnesium, zinc, Vitamin B6, and Omega-3s are all helpful for post-concussion syndrome. Long-term supplementation may be able to reverse the damage of the TBI. I use supplementation with most of my patients with TBI. I may also use specific supplements to treat specific problems related to the TBI, including sleep issues or anxiety. This allows for symptom relief while unwinding the damage related to the injury. Biofeedback though provides a more direct approach to helping TBI and treatment concussion. Neurofeedback measures the brain waves of a person and allows the brain to, in effect, see itself to recognize that there was an injury. A brain injury can result in the brain not recognizing that it has an injury. This is why I often see patients who don’t remember they had an injury but have many of the problems associated with a TBI. Neurofeedback appears to turn back on the brain’s own repair mechanisms. Studies show that neurofeedback is effective treating TBI. And it can also be helpful for anxiety, depression, migraines, insomnia, ADHD, and other conditions. Neurofeedback is only one treatment for TBI. New research is showing that Heart Rate Variability (HRV) Training can treat TBI. HRV training is a form of biofeedback. HRV is the measurement in subtle changes in heart rate between beats. Our heart beats at a different rates from moment to moment when we are resting. HRV is an excellent health assessment tool. Some researchers suggest that HRV may be the single biggest predictor of health in a person. Our HRV tends to decrease as we get older with a large drop as one nears death. Furthermore, HRV may be a way to calculate the progress of treatment of the TBI. HRV seems to change after a TBI. HeartMath helps reduce emotional symptoms related to TBI. HeartMath is a tool for concussions and for helping with many other conditions. HeartMath offers a home version of the device that allows patients to use on their own. I can review the data and assess their progress. I’m excited to have another tool for treatment and assessment in my practice. If you or someone you know has had even a mild knock to the head, have them evaluated. Even if you don’t remember having a concussion but have some of the symptoms, get checked. A qualified healthcare professional can help. Neurofeedback and supplementation may be able to help the problem that you are having. Feel free to call my office for more information.